St. Martin's Press, 9781250091864, 416pp. 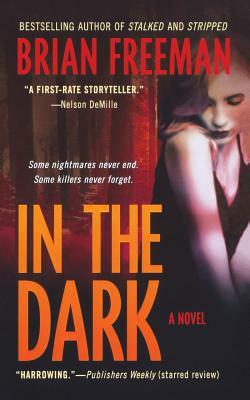 Brian Freeman's "In the Dark "takes Jonathan Stride on a dangerous trip deep into the past... It's the case that has haunted Stride for thirty years. In high school, he fell in love with Cindy Starr, the girl who would become his wife. But on the Fourth of July, the same night they cemented their love, Cindy's sister was savagely murdered. No one was ever arrested--and the case was closed. Now, decades later, a classmate has returned to Duluth to write a book about the crime. She knows secrets that a lot of people would like to keep hidden, including details about Cindy that leave Stride questioning his entire life. But when a girl is found drowned in the river--and a witness to the original murder attempts suicide--Stride realizes the ghosts of the past are alive and well..."and ready to kill again.